For the second straight day I have had to plow our driveway thanks to a near non-stop snow storm that has decided to take up residence in the heartland of Illinois. It was coming down pretty hard on our way back from our “dinner with a skunk” Valentines dinner last night – think I mentioned that event on my last post. Our local Wildlife Prairie Park holds the event as a fund raiser for their now privately funded park (thankfully taken back from our fiscally weak state). Yes, they do have a live skunk to visit and get pictures with. In the past they have had two, Tink and Tank, but this year we were sans Tank. Not sure why, but hope all is well with the little guy. If you haven’t made the association yet, this is a play on Pepé Le Pew who would likely be enemy #1 for the Metoo movement based on his aggressive behavior in those old cartoons. As expected, we had a great time socializing with our good friends and partaking in the festivities. Maybe I’ll even pull out our pictures with the Tink for a future post. Now that the effects of a free bar have worn off, time to get back up on that saddle and ride the [fence] posts. Hit the jump to see a few more shots of this elusive bird. This specimen was found sneaking around the South Padre Island Bird Viewing and Nature Center back in January 2017. The common description applied to these birds is secretive – often heard rarely seen. Like the Sora (link here) these medium sized birds prefer to hang out in the dense reeds of freshwater marshes, rarely revealing themselves to eager onlookers. A very kind lady pointed this specimen out to me. She was alone standing on the boardwalk looking over the Railing some distance ahead. As I approached she gave me the universal cation too heed loud noises and flagged me over to her station on the Railing and pointed down into a very small clearing of brush. At first struggling to comprehend the excitement, the mystery was soon solved – there over the side of the rail was a Rail (I was trying to trying to give you hints hehehe). 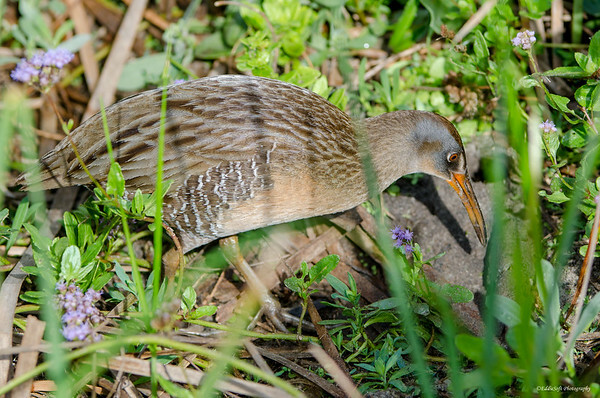 This was the first time viewing an actual Rail – body shape wise it was similar to the Sora I was familiar with, but the Sora has a much smaller and yellow bill. This species possesses quite the dagger. It was busy using that weapon to tear into a fish. Guessing the zest in attacking the flesh distracted it from the fact it was now exposed and being observed by a couple of humans with cameras. Thanks also needs to be extended to Ron. 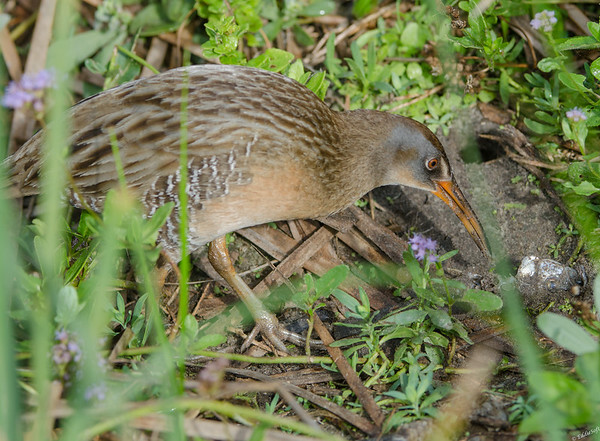 I was struggling to finalize the ID on this Rail switching back and forth from the smaller statured Virginia Rail and the larger Clapper Rail. This one was fairly small, maybe in the small Quail category and at the time I did not have a reference for the Clapper. 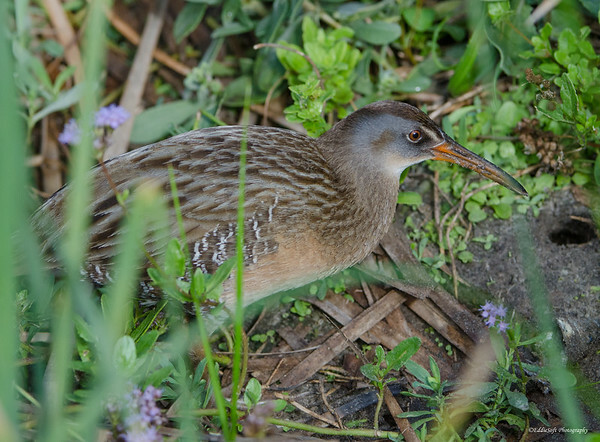 A bit of a spoiler alert – thanks to our last trip to the very same place a Clapper Rail is now officially in the tin. Going back to that reference, this specimen was significantly smaller. The heavy gray on the cheeks were telling signs, yet doubt remained even after pouring through reference books and online images. Ended up sending it to Ron who did his own investigation and indeed confirmed the Virginia classification. Guessing this was with a bit of regret since he has been able to hold his picture of one over me (currently one of the few birds on his blog link here). Successfully closed the gap on this one! 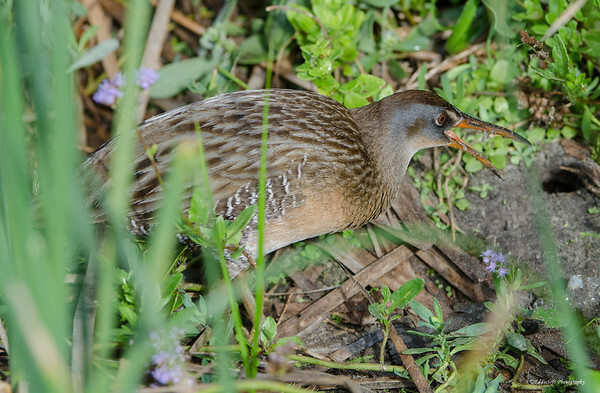 Eventually our exposed Rail had devoured most of its dinner and went back into the safety of the heavy marsh vegetation. Extremely appreciative of the lady pointing this out to me – I was able to pay it forward later in the day and numerous times on our last visit (Linda always makes fun of me when she leaves me for a bit only to come back surrounded by fellow birders hehehe). So, I set about trying to find out how this bird came to be named under the initial assumption it was probably just taking a holiday vacation from Virginia. Sorry to inform you, this will remain a mystery even after hitting as many sites as I could based on the Google’s response to my inquiry, Every reference reiterated the secretive nature of the Rails, noted the preference for freshwater marshes and how purpose built it was for the environment. They have strong leg muscle to flight muscle ratio, preferring to run away from danger. Their forehead feathers and flexible vertebrae are even adapted to withstand the dense reeds present in their preferred habitat. One other interesting tidbit, they can actually swim underwater using their wings for propulsion – likely only used as a means to get away from predators. Need to wrap this up. We drove up to Iowa today and are heading down to see if there are Eagles along the Mississippi.